Motorcycle accidents are one of the leading causes of traumatic brain injury (TBI). Next to falls (causing 35.2% of all TBIs), motorcyclists sustained 17.3% of all TBIs. Other causes included falling objects (16.5%), assaults (10%), or unknown factors (21%). Helmets have decreased the likelihood of suffering a brain injury, but they do not always prevent this type of injury or save a person’s life. Of the 1.7 million Americans who sustain a TBI each year, 52,000 die, 275,000 are hospitalized, and over 1.3 million are treated and released from the emergency room. The costs associated with brain injuries are substantially higher than any other type of injury, with the exception of spinal cord injuries, which are comparably expensive. According to the NHTSA, researchers have found the average cost of traumatic brain injury medical care to range from an estimated $18,527 to $43,214 for severe head trauma. Another NHTSA report from 2009 found TBIs to be of particular concern, as they were associated with “significantly higher hospital charges.” Furthermore, motorcyclists with TBI were less likely to be discharged home and more likely to require care in long-term rehabilitation facilities, which added significant cost. The median charges for hospitalized motorcyclists who survived to discharge were 13 times higher for those with TBI ($31,979 versus $2,461). A study by the University of Wisconsin’s Center for Health Systems Research and Analysis in 2013 found that traumatic brain injuries among motorcycle riders resulted in: direct medical costs of $207,336; other therapeutic and disability-related costs of $438,812; and $765,098 in quality of life costs. All told, the total comprehensive costs were over $1.4 million. By comparison, the average cost of motorcycle injuries that did not include TBI was $27,000. The direct medical costs and indirect costs (such as lost productivity) of TBI totaled an estimated $60 billion in the United States in 2000, according to a report published at Brainline.org. In the US, at least 5.3 million Americans are living with a long-term TBI that requires daily assistance from a caregiver. Victims of TBI suffered with memory problems, stress management disorders, and difficulty seeking employment. TBI can cause difficulty with sensations, emotions, behavior, cognition, and language skills. The risk for Alzheimer’s, Parkinson’s, epilepsy, and other serious health conditions also increases for TBI sufferers. Traumatic Brain Injury takes up as much as 10 percent of the total health care budget once you factor in loss of life and long-term disability. “The initial diagnosis of TBI on a computed tomographic (CT) scan of the head is often followed by intensive care unit (ICU) admission, neurosurgical consultation, and repeated imaging,” says Dr. Bellal A. Joseph, MD, of the Division of Trauma and Acute Care Surgery at the University of Arizona Medical Center. The cost of a hospital room is now more than $3,000 per day, which does not include lab tests, personnel, imaging, or consultations. Even “mild” brain injuries must be closely monitored to make sure the patient’s condition does not worsen over time. The extent of a brain injury can be difficult to detect initially — even among patients who end up requiring a lifetime of care. No one likes to ask for help, but you may have no choice but to pursue legal options for obtaining compensation once you see the bills stacking up. A 2008 study of motorcycle accident victims in Hanoi, Vietnam found that only 12 percent of households were able to pay the costs associated with treatment for traumatic brain injuries. Sixty percent of TBI victims could not resume work or daily activities after six months. Twenty percent of brain injury sufferers ended up with permanent disabilities and lost their roles as primary breadwinners. Though the exact dollar amounts of medical costs in Vietnam cannot be compared with medical costs in the US, the toll that these accidents and injuries take on the families is catastrophic, no matter where a person lives. USA Today reported: “Although Medicare, Medicaid and most insurers cover the brain surgery and intensive care necessary to save the lives of patients with such traumatic brain injuries… most insurers scrimp on benefits for rehab programs.” These programs, designed to help patients relearn skills and abilities destroyed by head trauma, may cost anywhere from $600 to $8,000 a day – a tab insurers just aren’t willing to pick up. Two-thirds of TBI sufferers are treated for 16 days and discharged without the additional care they need to function and get better. Don’t let your treatment be hindered by a lack of coverage or resources. Seek the help of a motorcycle accident attorney. 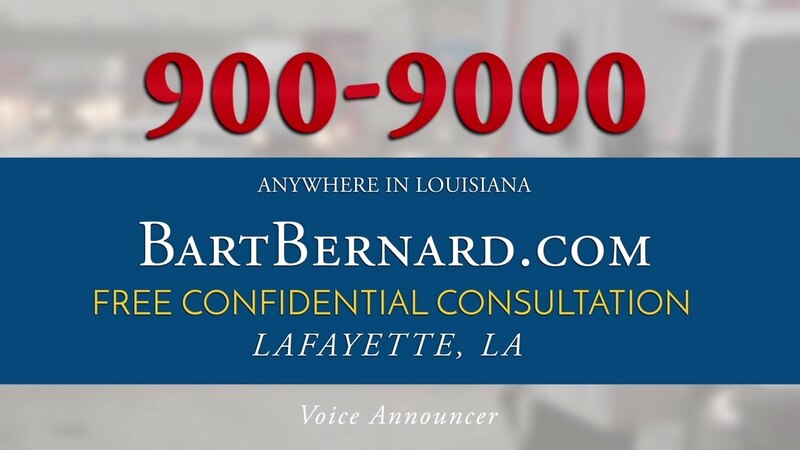 Bart Bernard is one of the most respected Lafayette motorcycle accident lawyers in the state of Louisiana, with law offices in Baton Rouge and Lafayette. For more than 20 years, he’s fought for just compensation for his clients, earning a spot among the Elite Lawyers of American and the Multi-Million Dollar Advocates Forum. Contact Bart Bernard for your free no-obligation consultation today. All legal services are provided free of charge until your case is won!